As the snow flies outside, and I ready for our overnight to Jackson inside, I just received a recipe exchange email from a bride. What fun. 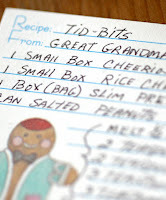 I followed the instructions and sent to 20 friends, and thought I would post my reply recipe here: My great-grandma's recipe for Tid-Bits, a holiday favorite. Quite fitting because you may be preparing snacks for friends this evening, or even in a few weeks for the Super Bowl. Great Grandma's Tid-Bits were always at my family gatherings as a kid, and I think of her every time I label my random blog posts in the "tidbits" category. Pour the above over cheerios mix in large roasting pan. Bake at 250 for 1 hour, stirring occasionally. 2007 has been an incredible year, both professionally and personally. I have been blessed with an amazing clientele who truly inspire and excite me with their love, kindness, creativity and trust. I couldn't ask for more and I sincerely thank you for sharing and trusting me to capture your most important memories. Several of you submitted your most favorite image from your 2007 wedding, a few of which are shown below (and I received many other emails like this, from Ashley and Fred: "I love all the pictures you took of our wedding and can't limit it down to just one.......... I know that's not helpful. Sorry!"). It was so interesting for me to see what stands out as your favorite image... perhaps not the most unique composition, lighting or moment (how I judge my photos), but the personal emotion attached to that image. Thank you so much for taking the time to contribute- you all will be receiving an 8x10 of your image in the mail shortly! And I will post my favorite images from 2007 next week. So what will you do to usher in 2008? J and I are headed to the village of Jackson, NH, where we photographed a wedding last New Year's Eve. Although we'll be doing some photography for the Inn at Jackson, we hope to also enjoy the quaintness of the sweet little village and surrounding town of North Conway. And even just one night, it's our first chance to get away alone since the regular season wrapped up. 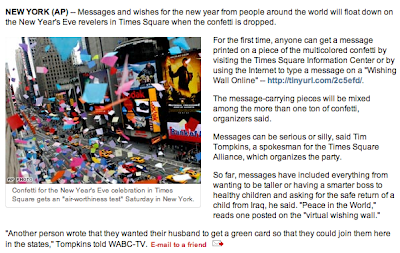 If you haven't made your new year's resolutions just yet, a neat way to share your wish is by submitting it to be printed on the confetti that will drop over Times Square on Monday night! Check out the link **here**! And see what people are wishing for **here**. Happy New Year, everyone! Continued good health and happiness for '08! As a Christmas gift to their parent's, hometown friend Robyn and her brother Jeff gave their parents a portrait sitting while all were home for the holidays (Jeff lives in Colorado). We met at Robyn's home in New Hampshire this afternoon for a quick portrait session with Robyn and Jeff, their spouses and children and, of course, their parents. Such fun! We pushed the dining room table out of the way for a different take on a typical family portrait. Thankfully Old Man Winter was kind to us in New England this Christmas. We managed to sneak outside for a few minutes- without coats! It was so great to see you again, Robyn, and spend some time with your beautiful family. Congratulations again on little Owen! If you celebrate Christmas, I hope yours was as fantastic as ours. Our marathon celebration started with family on Sunday and wrapped up last night, and included lots of time with my nephew Nathan (J enjoyed playing with Nathan's Thomas trains possibly more than Nathan), a Christmas Eve performance of A Christmas Carol at Portland Stage Company (perhaps a new tradition? ), Christmas Eve candlelight service at a new church, a Red Sox Monopoly game into the wee hours of the night (congrats J) and, of course, a very generous visit from St. Nick. I received many lovely gifts, several of which were inspired from posts on the blog (here, here and here) and my business colors of pink and chocolate brown. Fun! I am very tired, and very blessed. ps- Many thanks to J's mom for the sweet ornament! The holiday cards are in the mail (above is the front of the card we sent to our families), the shopping is done, the tree is up (our first real tree! ), plenty of snow in Maine is right on cue and, aside from a pesky cold that won't go away, I'm ready for Santa to visit! Thank you so much for the great holiday cards that have been cramming my mailbox for the last few weeks. It's so fun to see how many of my clients used an emilie inc. wedding or portrait image (and an extra special thanks to those who credited emilie inc. too!). For the first time, I did not include a traditional year-end letter in my holiday cards. In a modest move to be more green, I thought it would be best to save on paper since you all follow my every move on this blog anyway (Anyone else feel a tad guilty sending cards this year? I hope it's not too long before a more environmentally-friendly way of sending holiday cheer is en vogue. Maybe just postcards? Or something a bit more personal than e-cards?)! I did, however, take my own advice from the blog last year and order some personalized stamps. Too cute! It's a tall order, but I'm going to do my best to take some time away from the computer for a few days next week to visit with family and friends and soak up the spirit of the season. If you are able, I encourage you all to do the same. Hugs, happiness and health to all! Cheers! My last wedding of the regular season was in October and still, I hadn't found the time to squeeze in that deep tissue massage my back has been craving until today! I made an appointment with Lisa Morse (I photographed Lisa and Ehren's wedding in 2006. You may recall their wedding because the power went out during the reception! I also photographed Ehren's triplet's wedding, Matt, to Lisa's best friend Karen- yes it's a little confusing, last New Year's Eve). In addition to working in the cardiac department at Maine Med, Lisa started her own therapeutic massage business in July! Now, I'm not just saying this because she was once my client and now a friend, but she seriously gave me the best massage I have ever had! She applies a strong pressure for being such a small person and had some techniques for working out knots that I hadn't seen before. I highly recommend you give Lisa a call if you're looking for a little r&r escape, or still searching for that last minute gift. I have a few $10 gift certificates toward a massage (a regular massage is $65 for one hour) for the first five people who email (they expire at the end of January). Here is Lisa's contact information, and be sure to mention that you learned about her on my blog! She had an appointment right after me, so I wasn't able to take any pictures of her soothing office. But I will surely be going back again, and soon! To properly say farewell to 2007 later this month, I thought it most appropriate to ask those newlyweds married this year to reflect on what their favorite image is from their wedding day and why. Please take a minute and choose the ONE image that you simply love the most, then email me (photo@emilieinc.com) the image (or number from your online gallery), with a brief explanation, thoughts, feelings, etc., on why that image is so important to you both. I will post your replies here before New Year's, and I'd love to send you an 8x10 print for your time! Thank you! 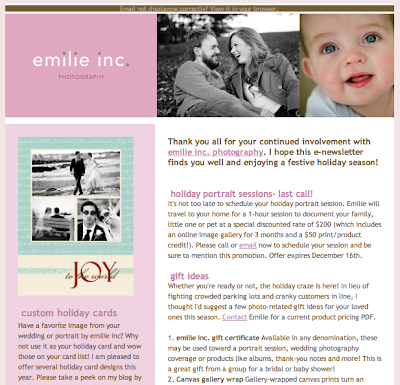 The emilie inc. holiday e-newsletter was sent on Friday evening. If you have already subscribed, be sure to check your inbox or spam folder for some holiday specials. And if you have not yet subscribed, you're missing out! Simply click on the newsletter sign-up link in the column at left!